Using many photos from visits to orchards during the picking season, I was able to construct a setting for this wonderful poem. Nan’s daughter and her little friend were the perfect models for this piece as they have such a loving relationship. I tried to hold myself back a bit as this image could easily become saccharine. I thought the brown and white chickens a good visual counterpoint to all the green. I need to always realize the colour balance in a painting. It would be so easy with Nan’s beautifully crafted stories to lose sight of the fact that I am illustrating the poem but I am also constructing a parallel visual world to her written work. This is a wonderful problem to have. 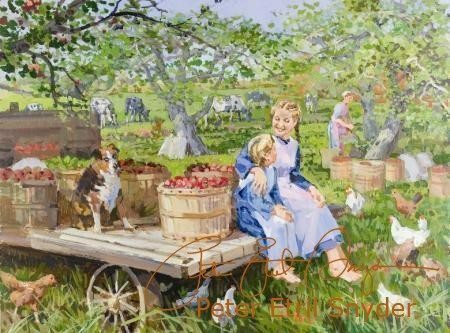 To see the other paintings in Winterberries and Apple Blossoms, click on the month: January, February, March, April, May, June, July, August, September, October, November and December.